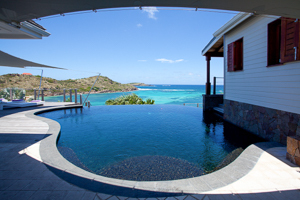 Villa UJV 119, also known as Indian Song, is an impressive five bedroom villa at the entrance of the Domaine du Levant enclave in Petit Cul de Sac, St Barts. It is built of stone & wood, and spreads over several levels. The villa features numerous sitting areas, including a large living room, a TV room with home theater, and an office with internet connection. The ambience of villa UJV 119 is harmonized by pastel and deep colored fabrics, along with wood, tile, and stone combinations. The effects of color and light are very striking. Tennis courts, exclusive to the guests of Domaine du Levant, are within walking distance. UJV 119 also has several chairs at Petit Cul de Sac beach, located just a minute's walk downhill from the villa. Every comfort has been taken care of at UJV 119, making this property a real gem. Villa UJV 119 rents at the 5-bedroom rate at Thanksgiving and has a 14 night minimum during the Christmas/New Years period. 6 years old, unless accompanied by a nanny.